Every month Frame USA partners with a different local or national charity. We give to each charity through donating time, money, exposure, and resources. For every order places on frameusa.com $0.75 is donated to the charity of the month. The charity for March 2019 is Pockets Full of Sunshine. 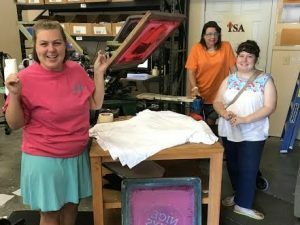 Pockets Full of Sunshine’s mission is to provide “socially inclusive employment opportunities for adults with intellectual and physical disabilities”. Special needs individuals are some of the kindest and most joyful people to know. This organization gets their name from describing special needs adults as “rays of sunshine”. Pockets Full of Sunshine believes that the general public’s discomfort with adults with disabilities comes from the lack of their inclusion in the community. They state on their website “Most individuals with disabilities are truly exceptional people with unique gifts and talents, who each have something to offer their community, be it performing a vocational service, or just offering a friendly smile.” This is why they seek provide opportunities for employment, increased independence, and personal growth for adults with disabilities. Pockets Full of Sunshine was founded by a Special Education teacher named Dayna and a Speech Language Pathologist named Laurin working together at a school. After bonding as colleagues, they wondered what happened to their special students as they grew older and aged out of the school system. Dayna’s brother sparked an idea by giving her by-product from a mechanical splined shaft and asking if her students could use it for anything. 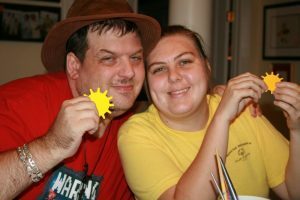 The item looked “exactly like a small yellow sunshine and Dayna was instantly inspired”. This sparked the idea for Pockets Full of Sunshine. If you would like to get involved, you can contact the organization through their website here. And remember that for the month of March 2019, $0.75 of every order on frameusa.com is donated to Pockets Full of Sunshine. You can also add an additional donation if you’d like on our checkout page.